Luis Suarez bit Branislav Ivanovic, and what? The outrage over Luis Suarez’s latest act of infamy is utterly bemusing. Judging by the reactions of the masses, the act of biting a fellow human adult is a crime of such moral revulsion that it can threaten the very future of football lest its perpetrator is forcibly deported and exiled from these purist shores. Overnight the facade that once sheltered through past controversies suddenly shattered under the weight of scrutiny from the press and public. No longer a “personality” or pantomime villain, it was as if his true nature had finally been revealed to the world for belated moral evisceration. While undoubtedly bizarre, such a response seems wholly disproportionate for a bite considering the sort of behavior from Suarez that has previously been accommodated. As yet more top ten lists and features detailing his depravity flood the social media channels, it’s worth questioning where this level of analysis with mitigating apology was following his indictment for racially abusing Patrice Evra? Even staying in the realms of the physical, his vicious eye gouge against Scott Parker last season was a far more serious offense and yet hardly left a ripple in the public conscious. 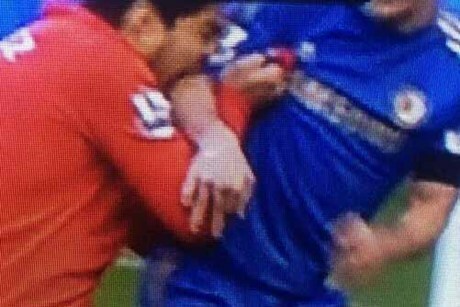 Unless Suarez is a carrier of rabies, attempting to blind someone with your fingernails is an act that potentially carries far more severe consequences than a bite. Priorities, as always, appear to be well and truly out of line with the severity of the issues at hand. The knee-jerk springing into action and judgement that followed Suarez’s nibble of Ivanovic wasn’t dissimilar to the white hot, grass roots rage that greeted the MP’s expenses scandal. As that particular drama rolled into overdrive thanks to prolonged public angst over money, body counts continued to grow in the Middle East as a result of wars that enjoyed neither the emotional investment or focus afforded a fraud scandal. Money is more valuable than lives, and biting is more repugnant than racism. The idea of blacklisting Suarez from the Premier League and sacking him as punishment is also utterly perverse. In what way is an ascent into the Champions League on increased wages and a juicy signing on fee a punishment, for Suarez would surely be a target for the great and the good of European football should Liverpool decide to offload him. Rather than offer him an escape route to riches and glory, why not allow him to wallow and stagnate at Anfield winning only minor honours at best as his reputation sinks to new lows with each passing season and controversy. You can already hear the sound of apologists sharpening their knives as they sift through YouTube for footage of Keane on Haaland and elbow strikes from across the leagues and eras, yet Suarez is different. His offenses are as systematic as his apologies are formulaic. There are no witch hunts or grand conspiracies, or even isolated incidents – this is the amoral, hyper-competitive nature of Luis Suarez: football’s Patrick Bateman. From the feigns of victimized injury following each and every foul and trick he attempts, to his false innocence and modesty as he woos online Kopites through their Twitter feeds, as Liverpool’s star player and misjudged anti-establishment hero, he is a maestro of stringing along the club’s most blinded, biased minority in the most cynical and self-serving ways possible. Announcing that he wishes the fine imposed on him by Liverpool should go to the Hillsborough Justice Campaign is possibly the only element of his latest outburst that sticks in the craw with equal disgust as his previous high-end catastrophes. So save the blood curdling fury and forget the bite. If you wanted to damn Luis Suarez you missed your chance in December 2011. Late comers citing his current misdemeanor as the “inexcusable” act in this epic saga of offenses should instead find themselves a mirror and judge their own values. This entry was posted in Analysis and opinion and tagged biting, liverpool, luis suarez, racism by Greg Johnson. Bookmark the permalink. Nobody ever does anything nasty to Suarez or does he just get on with it. stamped on by huth – no punishment. No excuses, no blinkers, no wet behind the ears I’m so excited about football and all its middle class smugness. No, put simply, Suarez is a flawed and temperamental genius of a footballer. His malaise is not an exclusive one. To characterise his excesses, especially in the Premier League, as particular to him would be naive in the extreme. His is a widespread disease. The diving, feigning, cheating nature of footballers is one of the great unsaid axioms of the game; there lies in the heart of the money obsessed, greedy, bloated body of football a rottenness so extreme that it’s shocking that more obvious examples aren’t exposed on a weekly basis. The main culprits in this collusion are the media; the cosy, incestuous nature of this symbiosis is one of the more troubling aspects of the Sky, prawn sandwich, middle class love in with the nation’s game. Suarez didn’t end someone’s career, he didn’t set out to. He isn’t a character motivated by the cult of self. He isn’t a self obsessed womaniser with a media persona and a swathe of advisors. His is a pure and simple desire to win at all costs and to hell with the fall out. However unsavoury, this is probably the aspect of the man’s character that others find most hard to swallow, so to speak. His past misdemeanours only add to this sense of complication. One of the main reasons the simplicity of the verdict in the Suarez/Evra case was so frustrating was the fact that any nuance or any gradation of colour was hopelessly lost in the media’s desire to have these easy, binary opposites. The incident has neatly been filed away; complete and clean. Suarez is a racist and the case has no shadow of doubt. The same with this case; the laughable moral high ground taken by TV automaton pundits (themselves dripping with the hypocrisy of their past deeds- Ron Atkinson, Souness, Keane, Keown etc) sticks in the craw far more than any perceived manipulation by Suarez. The over written platitudes of Daily Mail shock strike home with a right wing glee as if this is the only man in the league who does anything wrong. It makes the whole case simpler that he plays football for the bete noire that is Liverpool FC. It would be interesting to hypothesise what the media reaction would have been if this had been anyone but him. Suarez is a footballer strangely at odds with our expectations of modernity; a player whose actions if committed in the 60’s and 70’s would be regarded with a sepia tint of nostalgia; the rarely filmed exploits of Suarez’s forebears of the old First Division seem somehow forgiveable as the world seemed simpler then. Players punched and scratched and kicked and ripped their shirts off. They spat and bit and drank to excess. In the starched, corporate universe of today’s football landscape misdemeanours are analysed, agonised over, rewound and replayed, enlarged and written about with an alacrity that is both painfully over simplistic and sweepingly over generalised. There is no desire for a return to those dark days of football but that time had a purity in the intent of the footballer to win at all costs. What Suarez did is not new, ask Defoe. There is no excuse for biting a fellow professional. The man should be punished and accept that punishment but to characterise him in monochromatic relief is folly. Suarez will continue to confound and he more than likely haemorrhage support from friends at Anfield. He will become a footnote in the latest chapter of corporate cleanliness demanded by the binary obsessed nature of the world we live in. I, for one, won’t be glad to see him go. Very interesting perspective! Thanks for taking the time to write all that down in a comment Steven. Doesn’t this contradict the preceding paragraph? There it is argued that money and celebrity are being privileged above human life. Now it is argued that punishment could be assessed in terms of the material benefit (money, trophies) that banning Suarez from the English game might potentially bring him. Moral/ethical issues are prioritised in the first, then subordinated to material issues in the second. Hi Francois. Thanks for the comment! I see where you’re coming from but it would only be contradiction if I were advocating punishing Suarez through financial or material penalties. Instead I’m trying to point out that selling him would be an undeserved award for immorality that doesn’t force him to face up to any consequences for his actions. It’s that he should not be rewarded with glory or money rather than he should be punished materialistically. Does resolve the conflict for you? No – in a sense he is then not being dealt the moral punishment because of fears he might materially benefit from it. I’m not necessarily advocating life bans from the English game or anything like that. But the argument that he would make his money elsewhere doesn’t stack up – the argument that ‘well if I don’t do it, someone else will’ is generally a poor one wherever it is brought up in life. Well he may well be banned for an extended period of time while staying in the English game. Although materialism and morality rarely sit well together, I struggle to see how exiling him from the Premier League can be separated as a tenuous material concern. What moral punishment would he receive by moving to a more competitive club? Even ignoring the extra money, if he were to move to a top European club he’d be able to win major honours and enhancing his reputation through glory. I’m not even sure kicking him out of England would even constitute a moral punishment anyway. Perhaps he should be forced to run some community football coaching for kids or mentoring to amateur and non-league players?